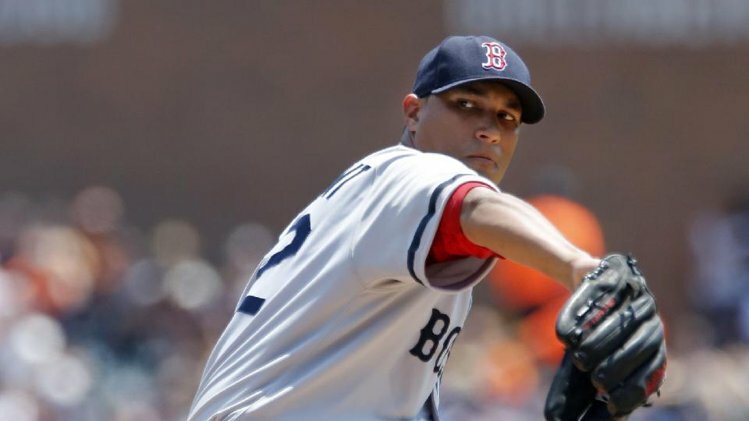 The big question on every Red Sox fan’s mind coming into this one: Which Felix Doubront would show up? Would it be the unflappable Felix who recently tied Babe Ruth’s Red Sox record (16, in 1916) for most consecutive starts in a season by a left-handed pitcher allowing three earned runs or less? Or would it be the Felix who only tossed four innings against the Yankees in his last outing, giving up seven runs on eight hits? Luckily, it was the former, not the latter, who took the mound for the Sox Wednesday in the rubber match of the three-game set against the Giants. Doubront went eight strong innings, allowing only one run on four hits while striking out three to move to 9-6 on the season as the Sox romped to a 12-1 win. After giving up a home run to Joaquin Arias in the second, Doubront would go on to retire 17 of the next 21 in a smooth-sailing start for the Venezuelan southpaw. Former Cy Young award winner Barry Zito was less than enigmatic for the Giants, giving up six runs on seven hits while walking three in only 3.2 innings of work. Reliever Mike Kickham continued the trend, allowing another six runs on five hits. Offensively, Stephen Drew only went 1 for 4 at the plate for Boston but made it count, ripping a three-run homer in the team's five-run seventh inning. Jonny Gomes, Jarrod Saltalamacchia and Will Middlebrooks also chipped in with two RBI each in the contest, while Saltalamacchia extended his hit streak to nine games. With the win, the Red Sox improved to an American League-best 23-12 in day games and avoided their fourth-straight series loss. 1) God Willing: After Zito walked Saltalamacchia in the second inning, Will Middlebrooks continued his torrid clip since returning to the team from Pawtucket, ripping a pitch deep into the left field stands with two out to give Boston a 2-0 lead. In 11 games since getting called back to the bigs, Middlebrooks is hitting .441 with a pair of homers and seven RBI. 2) Dustin’ The Line: After both Ellsbury and Victorino reached base to begin the third, Dustin Pedroia doubled sharply down the left field line to cash in Ellsbury, advance Victorino to third and give the Red Sox a 3-1 advantage. 3) Homecoming King: Two batters later and still in the third, Jonny Gomes — who hails from Petaluma, just north of San Francisco — delighted a group of hometown supporters in the AT&T Park stands when he singled to drive in both Victorino and Pedroia for a 5-1 Boston lead. 4) In-Drew-bitably: Ahead 8-1 in the seventh, Drew smoked a three-run bomb — his tenth long ball of the year — high and deep onto the right-field concourse to put this one on ice, driving in Gomes and Saltalamacchia ahead of him to give the Sox an 11-1 lead. The 75-54 Red Sox will enjoy a day off before heading south to Chavez Ravine to take on the red-hot 73-52 Dodgers — and renew acquaintances with former Red Sox players Hanley Ramirez, Adrian Gonzalez, Carl Crawford and Nick Punto — for three games beginning Friday before flying back to Fenway to host the Orioles for three starting Tuesday. John Lackey (8-10, 3.22 ERA) will get the start against Ricky Nolasco (4-1, 2.98 ERA) in Game One of the Dodgers-Red Sox matchup Friday.